Gwalia Falls (Cardigan ) - Gwalia Falls has a stunning, spectacular hilltop setting, overlooking the breathtaking sandy beach of Tresaith. The park offers you a peaceful holiday location, just 3 minutes walk from the sea. The Village Holiday Park (New Quay ) - Nestled peacefully in a countryside location just 2 miles away from the picturesque resort of New Quay with its cobbled streets and golden beaches, The Village offers all the peace and tranquility of a small, friendly holiday park with the convenience of being located less than one mile from the extensive facilities on offer at the sister park, ’Ocean Heights Leisure Park’. 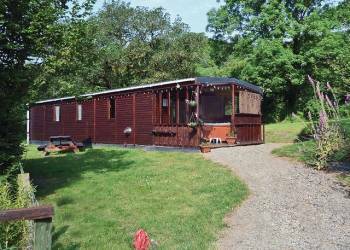 Wern Newydd Farm (Llandysul ) - Nestling in 40 acres of valley surrounded by oak forest these three romantic properties each with its own private hot tub offer a perfect year round setting in which to relax and unwind.